Does wondering whether your turntable is revolving too quickly or too slowly keep you up at night? If so, you’re probably an audiophile or an audioecstasist – one who seeks ecstasy through the audio arts. Perhaps you’ve got perfect pitch and can tell when something’s just not right. Maybe you’re on a quest for audio Nirvana. Or, you’re audio-competitive with your audio-friends. Whatever burden you suffer from, you’ve come to the right place to find the remedy. 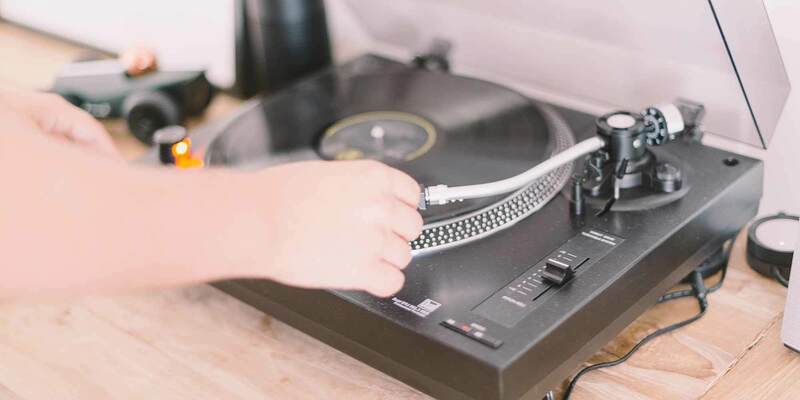 If you pay close attention and follow these instructions, you should be able to get your turntable rotating at nearly – if not exactly – the perfect speed. The first thing you must do is clean and lube every piece of your turntable. It’s important to ensure that everything is working as well as it can be before you do any tweaking. If you can reach these areas, try to get a small drop or two of high quality 20 weight synthetic oil (something like Redline D4 ATF) on the motor shaft and also where the spindle enters the housing. Only a drop or two! Buying a quart of this super-cool, high-tech, exotic transmission lubricant for just a few drops might seem a bit much. If you decide to go with something other than Redline, look for a 20 weight oil with PTFE (Teflon). Your next step is to make sure that your belt isn’t rubbing on anything. Belts can stretch to the point where they slip on the pulley, which would cause the turntable to turn too slowly. On the flipside, if particles of the belt have worn off and have gunked up the motor pulley, your turntable will rotate too rapidly due to an increased effective diameter. I suggest removing the belt and cleaning the pulley with a Q-tip dipped in denatured alcohol. Don’t use rubbing alcohol, though – it has lanolin in it, which will cause your belt to slip. Most belts will naturally stretch over a period of time. While stretching a few millimeters – up to 6mm – may not seem like a lot, it can severely slow down the turntable. If a belt is stretched only a few millimeters, you can still sometimes notice that the turntable speed has slowed. If the stretched belt is in good condition without being visibly degraded, you can shrink it back down to size with hot water. Fold the belt in two, and measure its size in millimeters before placing it into an empty saucepan. Next, heat a kettle of water to the boiling point, and pour the water over the belt. Let everything soak for five minutes. Measure the belt again after you take it out of the hot water, and you’ll note the size difference. Testing your turntable’s rotation speed. To test my turntable’s speed, I use the stroboscopic system. 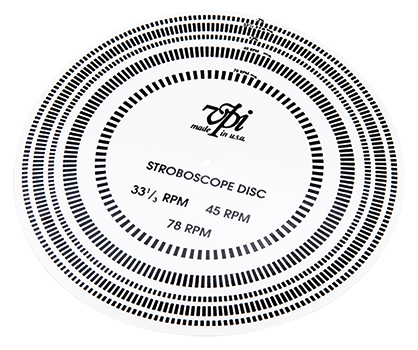 The stroboscopic system involves a cardboard disc with equally spaced markings that you place directly onto the turntable. Some turntable platters will come with stroboscopic markings already on the edge. The process works because of an optical illusion that allows you to make quick and precise adjustments if your speed is off. If you live in North America, you’ll need a stroboscopic disc that’s marked for 60 Hz. If you live in Europe, Asia, or Australia, you’ll need a 50 Hz disc. You can buy one of these discs or download one of the many available on the internet. If your turntable is spinning at the correct speed, the markings will appear to stand completely still. If they appear to drift left or right, your adjustment is off. The faster or slower the drift, the greater the error. The illusion is visible under any light – even fluorescents – though some people choose to purchase specialized strobe lights or LED bulbs. For even greater precision, put a record on, place the strobe disc on top of the record, and then put the tone-arm on the record. This will allow any adjustment to compensate for the additional drag the record and stylus impose. Where do you make the adjustments? 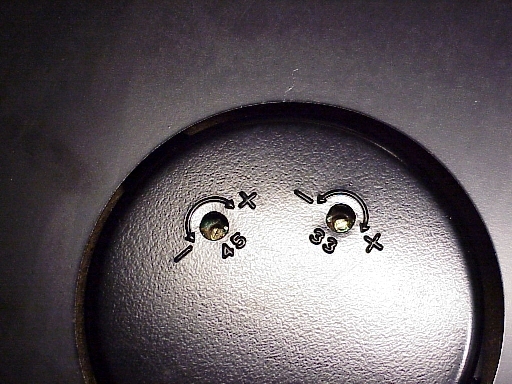 Turntable service manuals can often be found online and will tell you where the adjustment screws are on your table. In the event that you can’t find the right manual for your table, you can roll the dice and look at one for a similar model. If you’re still having trouble, try lifting the pad and checking under the platter for the adjustment screws. If they’re not there, look under the motor. Some turntables have surface knobs or holes that allow you to make adjustments from the top of the deck, but most adjust from underneath. It goes without saying that the turntable must be level before making adjustments. Block it up on wood or between two tables so that you’re able to get in underneath. Generally, the adjustment screws are set up so that a clockwise turn speeds up the platter, and a counterclockwise turn will slow it down. Always adjust the 33 1/3 rpm speed first. The truly particular audiophiles would use a small, non-metal (plastic/ceramic) screwdriver to make the adjustments, but that’s not absolutely necessary. The screws are adjusting the speed potentiometers. Be patient! Remember: making adjustments is a trial and error process. It’s quite difficult to get a turntable to spin 100% accurately, and you may never really get to that point. Even if you're within 3%, you'll still notice a lag. But with careful observance of these tips, you should have no problem getting within 1% of perfect.